If your air conditioner or heat pump unit is the culprit that caused a tripped circuit breaker in your house or office, there are a few possibilities why this happen. The earth leakage circuit breaker(ELCB) that trips the entire power supply to the house when a lightning strike can easily be restored by switching the lever back to the ON position. In the case of a faulty air conditioner equipment, the ELCB may trip due to earth leakage. In this case, you will need to isolate the cause of the fault or repair the equipment before power supply can be restored to the entire house. If the miniature circuit breaker(MCB) trips, the fault could be due to overcurrent or short circuit. Rectify the problem and power on the MCB. These circuit breakers are protection devices that protect the electrical circuitry from further damage without which fire hazard and electrical shocks may occurred. Short circuit of Live or Neutral line to the Ground will cause the ELCB to trip. Here are some of the possible causes of earth leakage that cause the earth leakage circuit breaker to trip. Compressor - The motor wires in the compressor touching the metal enclosure of the compressor. The wires of the motor may come off due to excessive vibration or fault in design. Once these wires that are connected to the hot circuits touched the metal enclosure which is grounded, current will flow to the ground causing the ELCB to trip. Disconnect the power and all the circuits to the terminal of the compressor. Use a multimeter and set the scale to measure resistance. Check the resistance between each of the terminal to the enclosure. If the reading is close to zero, that means that the exposed wire closest to that terminal has touched the metal frame. Repair the fault or replace the compressor before the equipment can be operated again. Fan Motor - Similarly, if the fault is due to the compressor fan motor or indoor blower motor, disconnect the power and isolate the circuits to the motor. Check the resistance of each terminal to the casing(if metal). If it is close to zero, that means that the exposed wire is touching the casing causing it to trip. Remove the motor for repair or replace with a new motor before the equipment can be operational again. Wires Shorted - In circuits that have live, neutral and earth wires bundled together, there is a possibility that the insulator of the wires breaks down (due to overheating, faults, under specs or inferior wires) causing the live or neutral conductor to touch the earth conductor. This will cause the circuit breaker to trip too. Trouble shooting this problem is more complicated as it involves not just a particular component but the electrical circuits. 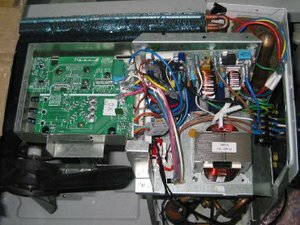 Sometimes, the miniature circuit breaker tripped after operating the air conditioner for some time due to over-current. This problem will take more time to troubleshoot as the problem does not happen immediately. Here are the possible causes. Loose Wire Connection - Disconnect the mains power before checking the connecting power from the mains to the equipment. For example, if there are 3 terminals that connect the power to the compressor, open up the housing and check the connection. Look out for darkend or black spots on the terminal indicating that overcurrent had occurred. A loose connection will cause arching hence drawing excessive supply and damaging the wires and the parts that are connected to it. Tightened the connection after removing and reconnecting the wire that has been damaged due to overheating. A qualify technician will usually be able to troubleshoot this problem by using a tong clamp ammeter to measure the current of that particular conductor. Compressor Locked - If the compressor has a mechanical part that malfunction causing it to lock, the current to operate it will be a few times more than the normal operation. When this happen continuously, the possibility of over-current to happen will occurred causing the circuit breaker to eventually tripped after a certain period of operation. Phase Loss - If the compressor or fan motor uses a 3-phase induction motor, a loss of one phase will cause overheating to occur when operating at full load. If the thermal overload protection does not trip, the circuit breaker will trip if the current exceeded its specification. A good design will usually has a phase loss protector built into the circuit to prevent the motor from running in the first place.